Click here to go to TAMARINDO ESTATES main page. 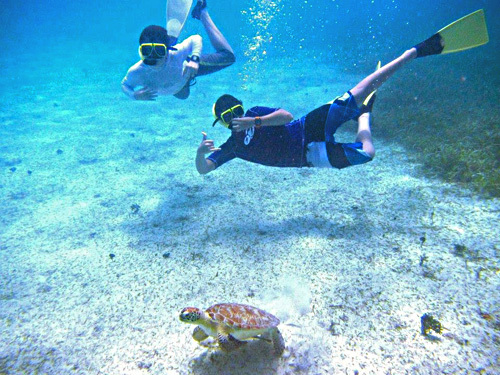 For more information on snorkeling near Tamarindo Estates, please click here. On the waterfront of Tamarindo Estates is the beautiful Tamarindo Estates reef. From the Estates you can walk north to the Carlos Rosario reef. You could also reach these and other reefs by water taxi or with a rental boat or kayak. 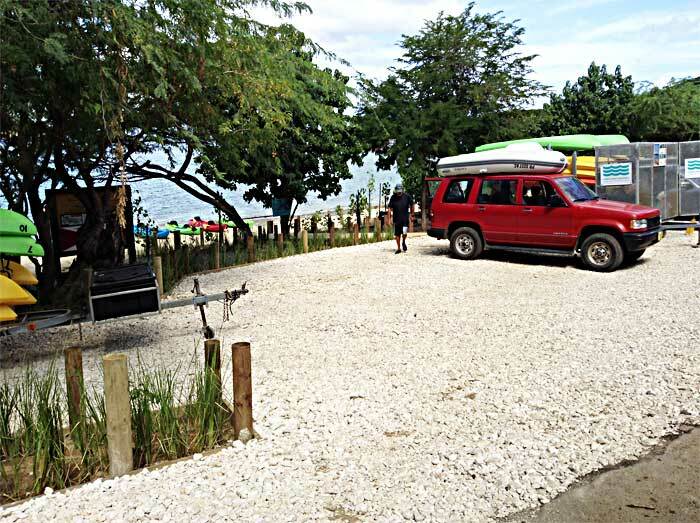 If you do not bring your own snorkeling gear, you can rent from the dive shops, gift shops, from El Nuevo Mini Mas store located by the fishing-coop gas station, and also from some of the water taxi operators. We suggest you bring reef walker shoes for your comfort and safety while snorkeling. For a good swim you could also go to Playa Tamarindo's sandy beach, an easy seven minute walk from the Estates. Flamenco Beach. The most popular and easily accessible of all beaches is Flamenco Beach. Years back the Pink Flamingos nested in the nearby lagoon, and that’s how it got its name ‘Flamenco’ in Spanish. Visitors and locals can get here easily and inexpensively. You can take a “publico” or taxi from town or bicycle or motor scooter along the paved roads. There is no fee to use the beach unless you are camping overnight. The beach is a long horseshoe stretch of white powder sand and crystalline waters, usually calm, except when some of the winter storms from the States bring the northerly swells down here. 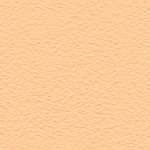 It is usually excellent for swimming and for kids to play and splashing water. The beach surroundings are patrolled and kept tidy by employees. There are also changing rooms and bathrooms. Visitors can picnic at one of several covered tables and snorkel or dive on one of the coral reefs located here. Beach chairs and umbrellas are rented. There are some kiosks where some food and refreshments are sold. Flamenco is a beautiful sandy beach but the snorkeling is limited. Facing the north, it is pounded by the occasional northerly that can create destruction to the shallow corals, to say nothing about many other beach goers who have managed to walk on top and damage most of the rest of it. For the reefs, head left up the beach as far as you can and you´ll find some interesting stuff or go all the way to the east side of the beach near the old concrete pier. Either place is okay for just looking around, but for the really good snorkeling the west and south side of Culebra is where it’s at. 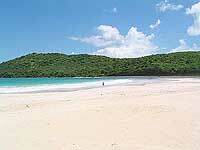 Tamarindo Beach (Playa Tamarindo)- For a nice swim and a good time enjoy pretty Tamarindo Beach. 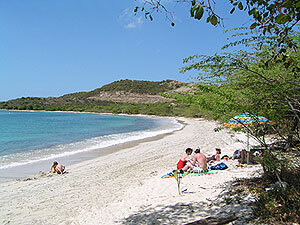 Tamarindo Beach has a good sandy area for swimming and sunbathing near the center of the bay, and lots of shade and calm crystal clear water. There is also some pretty decent snorkeling on the extreme right and left sides of the bay. The sandy beach areas of Tamarindo Beach are about a third of a mile from the entrance to Tamarindo Estates, an easy 5 to 7 minute walk from the Estates. Just about the center of the bay is a concrete structure where cattle were at one time weighed before being shipped to the main island of Puerto Rico. You can also hike to Carlos Rosario beach from here. For guests registered at Tamarindo Estates, on the waterfront from the Tamarindo Estates’ beach-house you will find quite good snorkeling. Because of the natural topography along the shoreline, access for outsiders to this snorkeling beach is difficult, so this is usually a very private beach for Tamarindo Estates’ registered guests. Carlos Rosario Beach. On the northwest side of Culebra, Carlos Rosario Beach is one of the best snorkeling spots on the island. The beach can be accessed by two different paths. The first begins at Flamenco Beach behind the parking lot on the left. A path leads up a hill and then turns north and down to the beach. 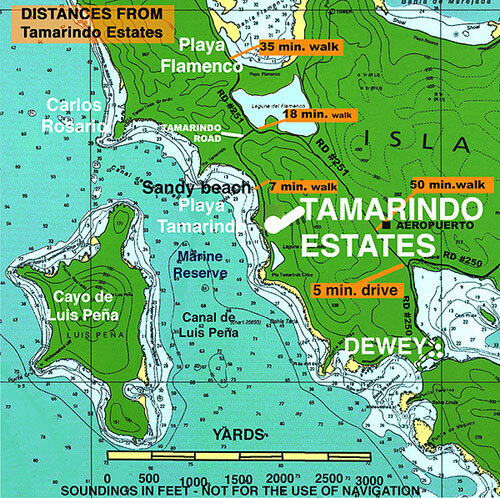 The second route begins at Tamarindo beach. 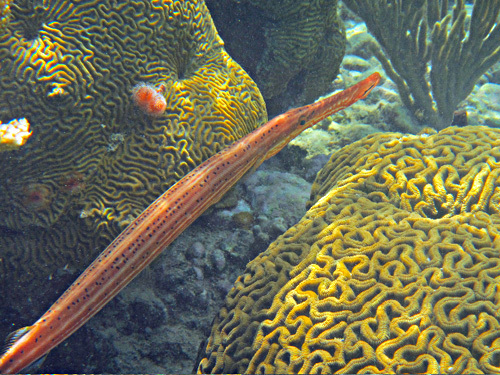 The topmost glory of Culebra´s snorkeling is the Wall –a mile of glowing colors. Located a quarter of a mile past Carlos Rosario to the north toward Flamenco Point, it flourishes with the flamboyant colors of abundant, vigorous corals; some of them are the huge fan corals, which swing impressively with the movement of the ocean waves. You could consider taking a water taxi to see greater extensions of the reef plus abundant beautiful fish moving around the reefs. Resaca Beach. Hiking. On the north side of the island, to the east of Flamenco Beach, this beach is spectacular. Swimming is not recommended here as the Spanish word ‘resaca’ means undertow! The hike to the beach is probably the most difficult of hikes on Culebra. The trail is quite steep and rocky. Resaca is mostly a surfer’s beach. It is one of the beaches monitored by the Fish and Wildlife Service for the turtle program. It is maintained by F&WL, which should be contacted if you plan to go down to the beach. Brava Beach. Hiking. On the north side of the island, Brava is very imposing. About a mile long, Brava Beach has a few palm trees for shade and lots of sand. 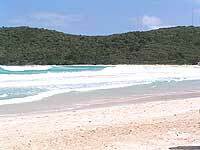 Being on the north side of the island, this beach will have some of the largest waves in Culebra. The name ‘Brava”, in fact, is the Spanish word meaning rough. There are also some really strong undercurrents here so take care not to venture out too far as the surf can be extremely dangerous. Access is quite difficult, so expect there to be few people. This beach is more for sun bathing. Zoní Beach. On the far east side, Zoni Beach is about a 15-minute drive from town. As you near the beach, you will go down a steep hill and enjoy a great view of the Atlantic Ocean, Cayo Norte, Culebrita and St. Thomas. This peaceful beach is good for picnicking and reading a book. Snorkeling is only “OK” around the points. Zoni is almost never crowded. It is known for some people shedding their clothes in its isolated areas. Soldado Beach. 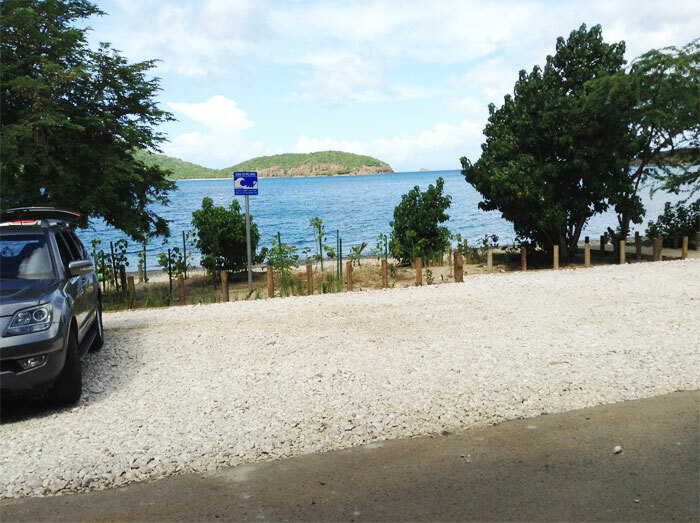 On the south side of Culebra, Soldado has a beautiful coral reef that is great for snorkeling or diving. Legend has it that a Spanish soldier (soldado) that had deserted was found here. Take the road from town across the bridge and to the left, on around the south side of the bay past Club Seabourne. At the time of this writing the road is drivable but watch out for water-rotted parts. Since most of the beach is rocky, it´s a great place to beach comb. The best snorkeling is out to the left (southeast), about a 50-yard swim toward the point. Most of the reef is located in about 10 to 30 feet. The visibility is normally very good. Melones Point. Only a short drive or 15 minute walk from town, Melones is a popular local spot. It gets its name from the abundance of marine cactus. From town, take the road up toward the clinic. Melones has two good snorkeling spots. Some very fine sunsets can be enjoyed here too. Culebrita Island. 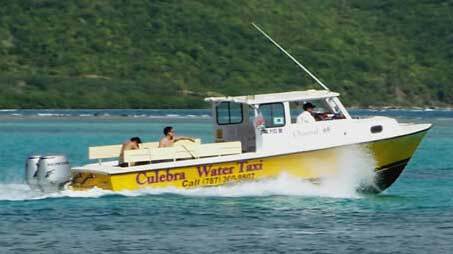 Located east of Culebra, Culebrita is one of the most beautiful cays. Hire a local water taxi or if you are adventurous, rent a kayak or motorboat to spend a memorable day on this gorgeous island park in the sun. 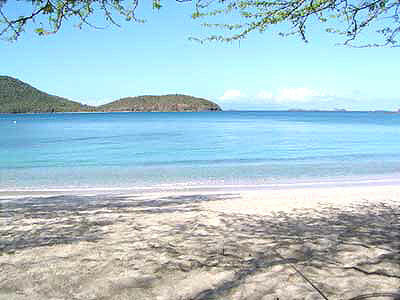 Culebrita has six beaches, including Tortuga (on the north side) one of the most beautiful in the Caribbean. At the northeast corner of Tortuga beach is a spot known as “the baths”. The views from the short hike up to the old lighthouse (reportedly one of the oldest in the Caribbean) are among the finest in the Caribbean. Luis Peña Cay. Located west of Culebra. Now it is a part of the U.S. Fish and Wildlife Refuge. It is one mile across the channel from Tamarindo Estates. 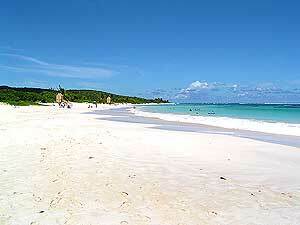 It has several beautiful sandy beaches, the most popular North Beach, on the north side of the island. North Beach is lined by sea grapes on one side and by a coral reef on the other. 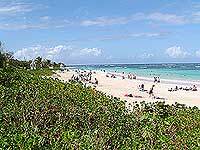 However, the southwest side of Luis Peña has a sandy beach that quickly succumbs to the corals and marine life. It is perfect for snorkelers. The rocky points near these beaches are Tropicbird nesting areas for Tropicbirds. Bring your lunch and hire one of the local water taxis or for the more adventurous, rent a kayak or boat to spend an unforgettable day. SEABIRDS: The Culebra National Wildlife Refuge was established in 1909 as a wildlife preserve. By 1976, primary jurisdiction for the outlying islands was transferred to the U.S. Fish and Wildlife Service. With the addition of land on the main island of Culebra in the 1980's, the refuge currently totals approximately l,568 acres. The refuge's diverse wildlife habitats include subtropical dry forest, mangrove forest, and numerous small islands. 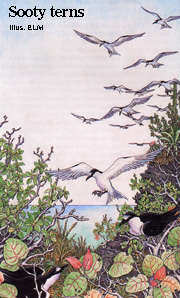 The refuge supports a variety of breeding seabirds including Laughing Gulls, Bridled Terns, Brown Noddies, Roseate Terns, White-tailed, and Red-billed Tropicbirds and three species of Boobies. More than 50,000 seabirds find their way to this tiny dot in the ocean every year to breed and nurture their young. The largest colony, numbering over 15,000 birds, is the Sooty Tern colony located on Flamenco Peninsula. The majority of the species nesting in the area are migratory and are present only from May to September. However, others breed throughout the year. NON-SEA BIRDS: There is a large variety of birds in the vicinity of the Tamarindo Estates property and in Culebra in general. You may see a list of birds in Culebra as prepared by the Fish and Wildlife Service. There is a good guide for birding in Puerto Rico: Guide to the Birds of Puerto Rico and the Virgin Islands, Rev. Ed., by Herbert Raffaelle. DIVING: Until 1975, Culebra was an active Navy range for training. As such, the area was off-limits to boating and marine activities. Because of this history , most of the reefs are in excellent condition and marine life is abundant everywhere. 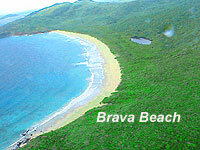 The small islands around Culebra are protected by the U.S. Fish and Wildlife Service. These islands and other rock out cropings offer over 50 dive sites with some very dramatic scenery. Photographers love it here, both on land and underwater. Schools of Angelfish, Spade Fish, and Spanish Gruts are so plentiful that you cannot help but have several "models" to work with! There are fan corals 4 to 6 feet across, soft Gorgonians and Sponges of the most beautiful colors imaginable. 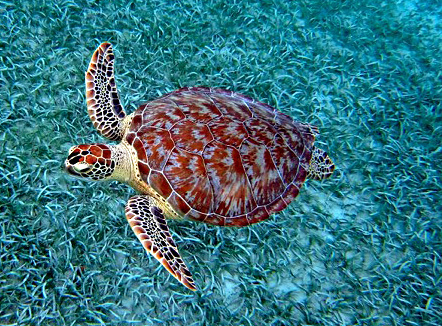 Green sea turtles and enjoy their majestic beauty!" FISHING: Go for light tackle trips for Tarpon, Snook, Jacks, and Barracuda and fly for King Mackarel, Black Fin Tuna, and False Albacore. There are a lot of big Bonefish. 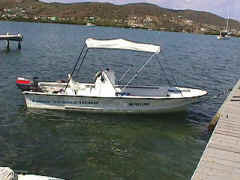 You could take a charted boat with a guide or do some fishing on your own in a rentad bare boat or in a kayak. WILDLIFE AND THE TURTLE PROGRAM: The Culebra National Wildlife Refuge was established on February 27, 1909 by Theodore Roosevelt, making it one of the oldest refuges in the system. Early ornithologists, including B.S. Bowdish, A. Wetmore and S.T. Danforth, described the birds in and around the Culebra Archipelago, but it wasn't until 1971 that new surveys by the Keplers revealed the wide variety of nesting seabirds and their numbers. 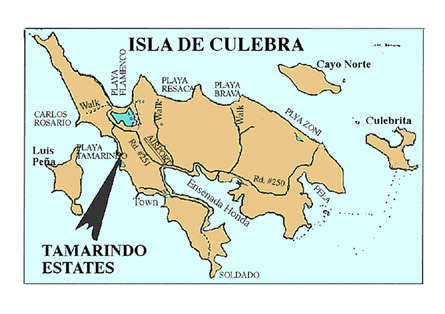 The offshore islands (except Cayo Norte) totaling 702 acres came under Fish and Wildlifc Service Administration in 1975 when the Navy left Culebra. In 1982 an additional 776 acres, of unique wildlife habitat, were transferred from the Navy into the Culebra National Wildlife Refuge. These refuges, managed principally for migratory birds and other unique wildlife values, are part of the National Wildlife Refuge System in the Department of the Interior. 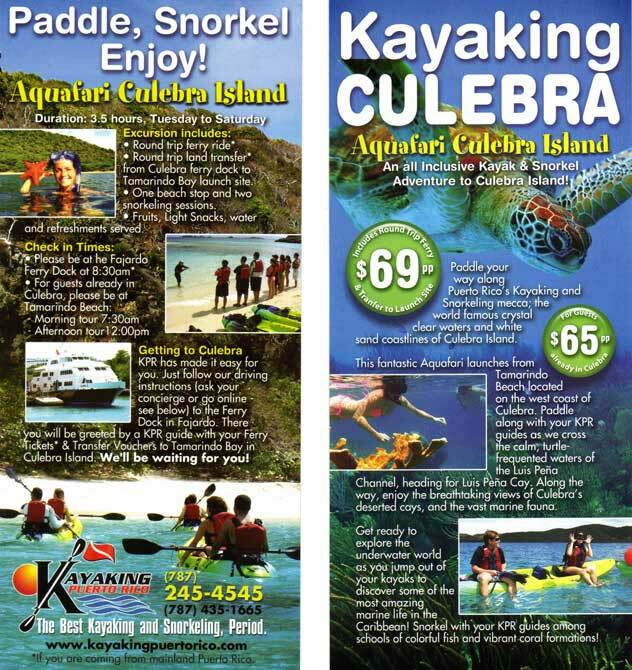 The Culebra Refuge, which comprises about 1,480 acres, includes 23 islands and rocks in addition to the four tracts on the main island of Culebra. The refuge is well known as a nesting site for a variety of seabirds and preserves important habitat for the endangered leatherback and hawksbill sea turtles and the Culebra giant anole. There are no restaurants at Tamarindo. For eating out you can go to town, where most of the restaurants are located, an easy 5 minute drive from Tamarindo Estates. Town, across street from Methodist Ch. La Cava Gift Shop, 787-742-0566, glass, brass, and tin lamps, nautical gifts, large carvings, nic-nac galore, snorkeling gear Tent City, on Flamenco Beach, 787-226-0232, camping equipment, beach chairs,snorkel gear, flotation devices, beach accessories, sunglasses, towels, swimwear. For the peak tourist times of the year we suggest you make car rental reservations ahead of time. Most visitors at Tamarindo Estates opt to rent a car. back and forth between town and the popular public beach Flamenco. TAXI SERVICES: Adriano 787-590-1375; Alexander 787-435-0227; Angel 787-455-1892; Charlie 787-407-8186; García 787-435-9901; Jayleen 787-514-9205; Juan 787-243-6252; Kenny 787-449-0598; Lawrence 787-983-5403; Miguel 787-421-6095; Miguelito 787-473-2594; Nata 787-969-2863; Nelson 787-972-0928; Nelly 787-643-7110; Ranty 787-645-5355; Raul 787-358-4816; Ruben 787-405-1209; Trinidad 787-461-1046; Victor 787-718-1006; Wilfredo 787-586-6692; Willy 787-449-0580; Xavier 787-463-0475; Yadiel 787-445-6686.
the times when we can do check ins for our rental apartments. Check-ins cannot be done after 6:30PM.